A few weeks ago Homer conducted a workshop on pen building. 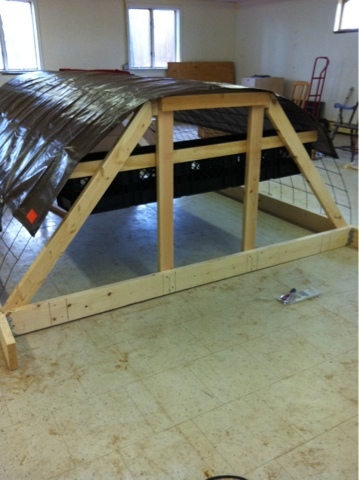 It's a design that works great for turkeys, broilers, pigs, vegetables and laying hens. And then this morning he revised the design. Milk crates work great for laying hens: light, strong and holes along the bottom for getting rid of icky stuff. But having things stamped with "property of" and dairy names is not attractive. A source was located for plain, unmarked milk crates. 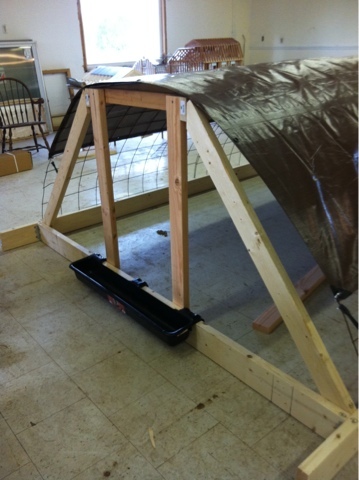 He will add Sunnyside Farm to them, but for now they are unadorned and inside the pens, covered by the tarp and easy egg access with limited escape pathways for the hens. A minor change, but major for a pasture based operation, makes it easy to keep those birds moving! And additional options for water for those thirsty hens..